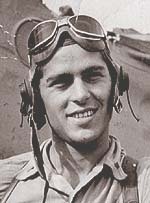 Summary: Designated Naval Aviator 27 May 1942 (NA #12341) at Corpus Christi, Texas, and commissioned United STates Marine Corps Reserve. Credited with four aerial victories at Guadalcanal with VMF-112. Marine Corps career assignments included: Commanding Officer, VMF-115 (Korea); Commanding Offifer, MARS-17; CO, H&MS-2; CO, VMF-311; Commanding Officer, 1st ANGLICO; Aide de Camp CMC; Commanding Officer, 24th MEU; CO, MAG-24; Chief of Operations, SOG MACV (Vietnam). Retired during 1968 as a Colonel. Personal military awards include: Distinguished Flying Cross (2), Air Medals, Navy Commendation; Vietnamese Honor Medal First Class. Post-Marine Corps service included account executive, New York Stock Exchange, Furniture business manager, and director of physical plant, Hawaii Pacific University. Died of leukemia 27 July 2000 in Kaneohe, Hawaii. Buried at Arlington National Cemetery.